There’s only one place in the world where a six-year-old you’ve probably never heard of is more popular than Taylor Swift and Beyoncé, and that’s YouTube. Yes, you read that right. Ryan from Ryan ToysReview has over 15.5 billion views on YouTube, amassing an estimated $2 million–$32.2 million of annual revenue. And we’re just getting started. YouTube turns the world upside down. It’s a place where celebrities like Justin Bieber and Carly Rae Jepsen were discovered, where Gangnam Style and cat videos live, and where ordinary people can do ordinary things—and get internet famous. 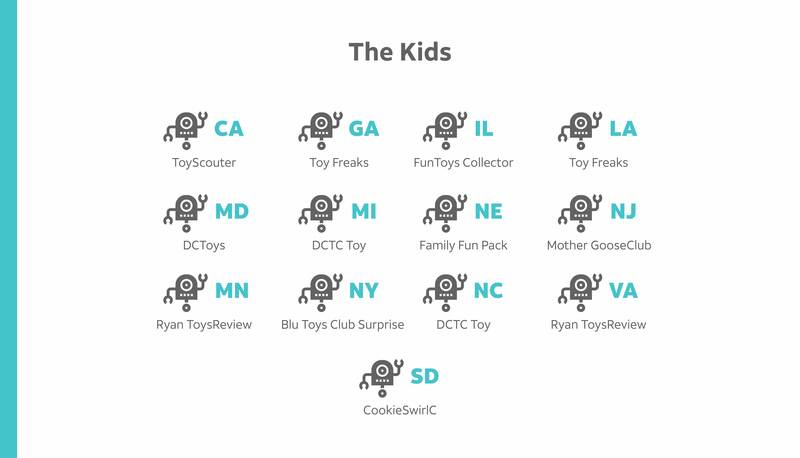 It’s because of phenomenons like Ryan ToysReview and other similar channels that our team at All Home Connections decided to do a little digging of our own. Using SocialBlade and Google Trends, we determined which YouTube channel is the most popular in each state. Think you might be able to guess your state’s favorite channel? You might want to guess again. . . When T-Swift launched her latest music video “Look What You Made Me Do” on August 27, it received 43.2 million views within the first 24 hours—surpassing the 25.6 million people who watched the 2016 Oscars. Moral of the story? YouTube VEVO is a big deal right now. In fact, if yours is one of the 20 states who watch it more than anything else, you’re right on trend with the rest of the world. According to a Nielsen report, music downloads are down from 2015 by 25%, and video streaming is up 7.5%—meaning that more users are streaming and engaging with music than ever before. 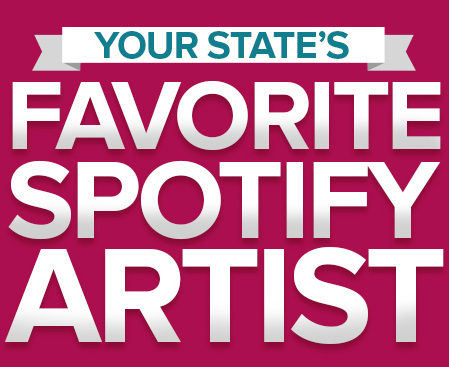 So, whether your state is listening to Maroon5, Rihanna, Beyoncé, or Maluma and Shakira (we mean you, Oregon), we say jam on. Chances are you’ve never heard of Toy Freaks, Toy Scouter, or CookieSwirlC, but these kid channels and others like them are racking up a ton of views (and cash). What are the majority of these kid channels showing? Other kids unboxing new toys and playing with them. Simple as that. Between the seven most-watched kids’ channels, they make upwards of $7 million a month, and $82 million a year. Suddenly viewing parenthood in a new light? Yeah, we are too. Props to the 13 states whose kids seem to know what they want out of life. There are those who game, and then there are those who watch others game. Then there are those who make millions of dollars by posting videos of themselves gaming on YouTube— like IGN, PewDiePie, and Markiplier. PewDiePie alone has the most subscribers of any channel on YouTube (amounting to just over 57 million). We’re not judging, but the extreme temperatures in most of the nine gaming states might explain why they’re spending a lot of time inside. 46 trillion views combined amounts to quite a few closet nerds. When it comes to embracing the good ol’ Southern tradition of settling your scores by wrestling in the dirt, Alabama, Kentucky, and West Virginia are in favor–explaining their interest in WWE and large belt buckles. 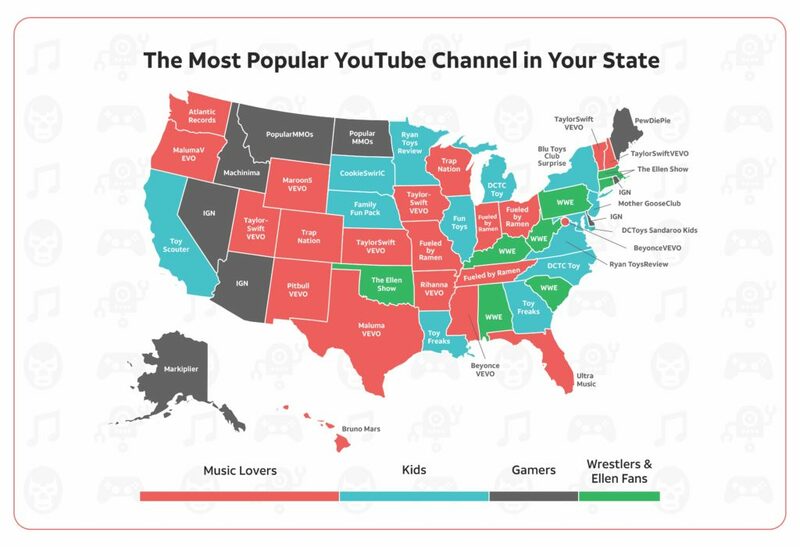 Pennsylvania is the proud home to 68 professional wrestlers (explaining that interest), whose third most-watched YouTube channel also happens to be Ellen. Connecticut, Oklahoma, and Massachusetts all prefer Ellen, who has nearly 10 million views on YouTube, and over 20 million subscribers. If you’re YouTube famous, you might even find yourself on Ellen’s show someday. “Just keep streaming,” as she would say—you never know when your moment will come. 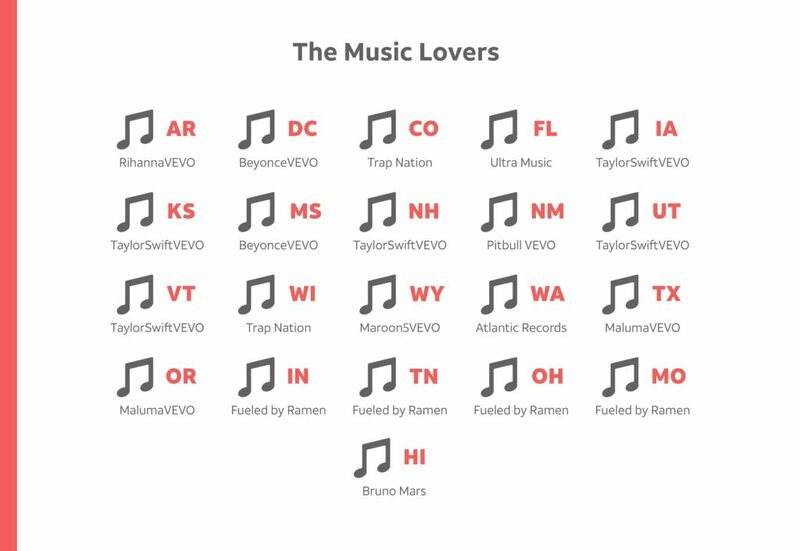 How’d we determine which YouTube channels were most watched in your state? We used a list compiled by SocialBlade of the top 50 channels in the U.S. with the most views, and then analyzed each channel with Google Trends to find which were most popular by state. Feeling like you might belong in the world of YouTube? Boost your confidence knowing there are 300 hours of video uploaded every minute and 4 billion videos watched daily—making your chances of success a definitive reality. Broken Phone Stats: Heartbreaking? Or Hilarious? ¿Qué tan probable es que dañes tu nuevo celular?